The worms that invade your brain! The most common form of brain tapeworm is mainly the pork tapeworm. Once you consume them, they can move throughout your body, your eyes, your tissues and most commonly your brain. They leave doctors puzzled in their wake as they migrate and settle to feed on the body they're invading; a classic parasite, but this one can get into your head. "Very few things move in the brain," says Dr. Effrossyni Gkrania-Klotsas about a British man found to have a tapeworm moving inside his brain in 2013. This form of tapeworm had never been seen before in the United Kingdom. These worms are pretty mysterious! The adult form of the Spirometra tapeworm only occurs in the intestines of cats and dogs but as these animals shed the worms' eggs in their faeces the eggs can enter, and contaminate, water. The resulting juvenile form of tapeworm known as larvae can then stay in the water within certain small crustaceans or end up in frogs and snakes. As larvae they can invade humans through ingestion or direct contact with infected animals. The pork species, known as Taenia Solium, can infect humans in two forms. The first is by eating undercooked pork from infected pigs, resulting in taeniasis -- an adult worm residing in the intestine. The second, in the larval form, through contact with the faeces of an infected pig or human, which can go on to infect many tissues. 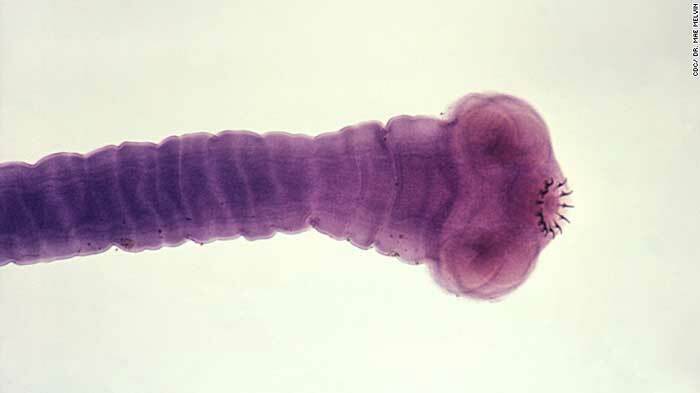 If the larval worm enters the nervous system, including the brain, it can result in a condition known as neurocysticercosis.